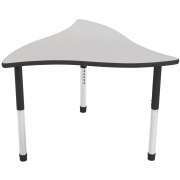 Which tables are best for your preschool? 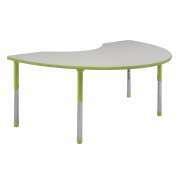 Hertz Furniture&apos;s preschool tables come in many fun shapes, colors and styles so you can find whichever kind you need at an affordable price. 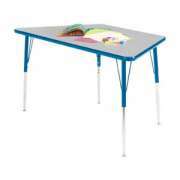 Young learners will just love working and playing at appropriately-sized classroom tables that are built just for them. There are many different kinds of preschool tables. Our sand and water tables provide great educational fun. Play tables are great for your imaginative-play centers and block corners. 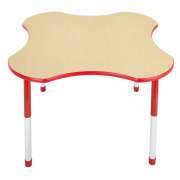 If you are working with little ones, check out our wonderful toddler tables. 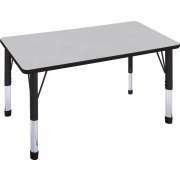 The right activity table has to fit your classroom, your students and your needs. There are many different shapes to choose from, each of which offers unique advantages. Lower seating capacities facilitate more intimate work and play, while larger tables enable more children to work together. 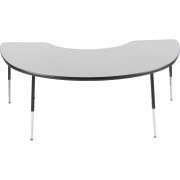 What is the best shape for a preschool table? Shape and color can add a lot to your learning environment. 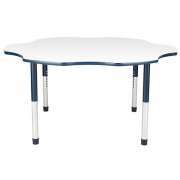 Educational Edge preschool tables feature colored edge banding that will brighten up your classroom. 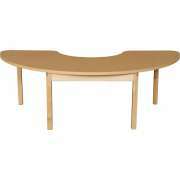 A circular, flower, kidney or trapezoid shaped table can really add some flair. 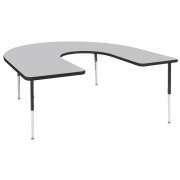 Horseshoe-shaped classroom tables offer distinct advantages. Not only do they have a creative twist on the classic classroom table design, they also facilitate small group learning and cooperation. With one teacher seated in the middle and six children around the outside, everyone can interact while receiving personal attention from the teacher. 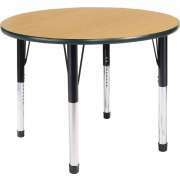 While many toddler tables are constructed from a combination of laminate and steel, we also have great wooden tables. Wood lends a natural feel to your classroom and can be coordinated with bookcases or wooden play furniture. We offer some specialized wood tables including the Wood Designs tot table and work bench, both of which are sure to become fast favorites in your preschool activity centers. Tired of carrying crayons and pencils back and forth so students can draw? 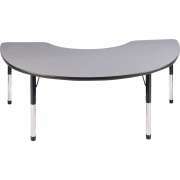 With the move-up game table from Gressco, your days of lugging heavy supply boxes are over. 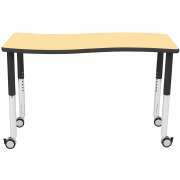 This convenient kids craft table features casters for easy relocation and built-in storage for all of your art supplies. 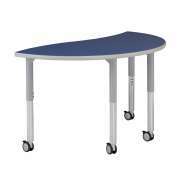 The middle of the table opens into a compartment so students can easily reach in and get the supplies they need. This arrangement is great for art projects or a permanent drawing corner. What kind of activity centers should I have in my preschool classroom? No preschool is complete without a sand and water table. This fun piece of classroom furniture helps children develop their fine motor skills as they explore different textures and engage in cooperative play. We have a number of great water tables for kids, some of which come with lids to ensure that nothing unwanted will fall in. They are perfect for a sensory learning center. For a bit of lunchtime fun, you might want to consider a bench table. No more pushing-in chairs and making sure that there are enough seats. Preschool picnic tables are the perfect size for your little ones, so they can slide in and sit down independently. This setup is perfect for meal times as well as activities and projects. How can all of the toddlers in my preschool sit together at a table? Try a six- or eight-seater toddler table for an excellent seating solution that caregivers and young students will just love. 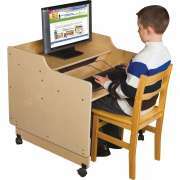 The built-in seats enable both little ones and their teachers to reach the surface easily without having to strain. This arrangement is exceptional because it lets the teacher interact with and take care of many children at once, while remaining seated. Instead of having to get a separate toddler table and chairs, you can have it all in one cozy unit. What kind of table fits with the latest pre-k classroom trends? 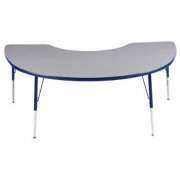 Your preschool tables should be arranged to complement classroom centers. Today’s educational trends are increasingly moving toward self-directed play and child-led learning. Having a flexible classroom with furniture that can easily be rearranged for group work and special activities is key. 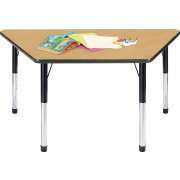 Choosing classroom tables in versatile shapes that can work for differentiated learning centers is important if you want to keep up with the latest in pre-k classroom design. Preschool tables are a must-have for every preschool, daycare and early-childhood setting. They serve as a critical tool for skills development through activities, play and interactions. 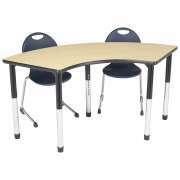 Hertz Furniture&apos;s excellent selection has everything you need to furnish your classroom from learning centers to eating spaces and beyond. If you need help choosing the optimal table or you are not sure how many can fit in the space you have, call the Hertz Design Center for expert project-planning advice.